Mr Macron visited Germany on Sunday to commemorate both the end of World War One and Germany’s Day of Mourning for victims of dictatorship and war, the Frenchman meeting with German Chancellor Angela Merkel afterwards to discuss the EU army and how to counter the growing strength of eurosceptics in the run-up to the European elections in May 2019. Addressing the German Bundestag, Macron made clear who he believed to be the founders of the bloc of 27 nations (minus Britain, which will be leaving the EU in March), regarding others as “partners” who have since joined the Franco-German axis. 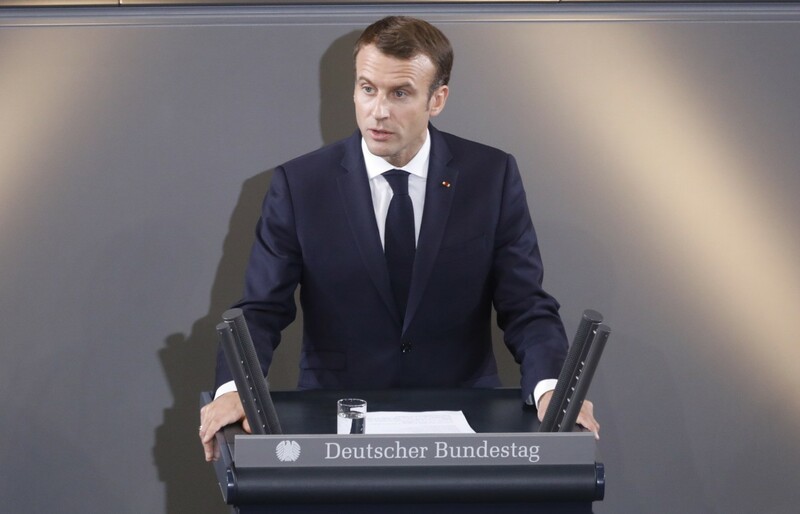 “We have turned the Franco-German couple into the heart of the United Europe to which other partners have gradually joined who had in the past been our allies or adversaries,” he said. Laying out clearly his plan for a more federalised EU, a closer union, a United States of Europe, Mr Macron told the parliament: “Of course it causes some anguish because we have to share decision making on policies, migration policies, development policies, and share our fiscal resources. It was both in reference to a European defence force and criticisms of “nationalism” that Mr Macron was condemning U.S. President Donald Trump in all but name. 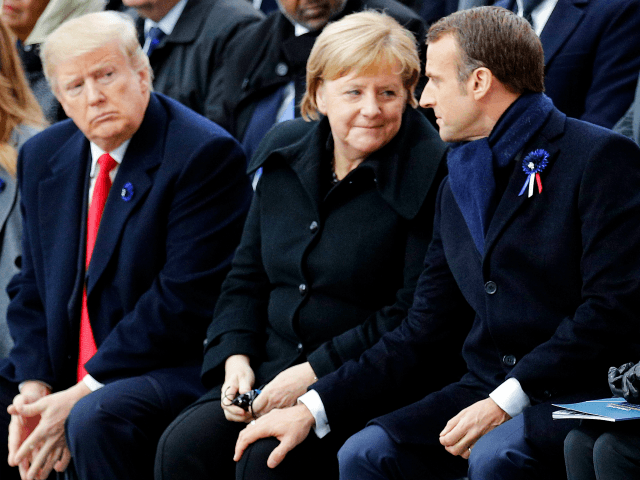 Last week, Macron called nationalism “treason”, after Trump had announced in October that he was a “nationalist” and not a “globalist” — a position shared by half of the American population. He also called for an EU army to protect against China, Russia, “and even the United States of America” — raising questions as to whether his several references in Sunday’s speech to “powers that want to eliminate us, attack our democracy” referred to historic ally and NATO partner the United States, besides others. Expressing an anxiety that Europe “plays only a second role on the world stage,” Macron declared that “The Franco-German partnership has an obligation not to let the world fall into chaos and to lead Europe to peace. Last week, German Chancellor Merkel backed calls for an EU army in the European Union’s Parliament, with Brussels bureaucrats expressing their “delight” that Germany and France were leading the charge for a Europe without 27 national armies, but instead one controlled centrally by Brussels. Despite German Chancellor Angela Merkel and Mr Macron making a show of unity and European leadership Sunday, both politicians are severely weakened in their respective countries. A poll released Sunday shows that Macron has only 25 per cent of public support, the day after France saw nation-wide protest by more than a quarter of a million people protesting against massive fuel tax hikes — the largest coordinated civil action against Macron’s policies to date. Meanwhile in Germany, after suffering in regional elections and her party having the worst election results in the Bundestag since 1949, Merkel has announced that she will step down as leader of the Christian Democratic Union, and after 13 years as Chancellor will not run in the next election — in 2021.